Feb. 2, 2015 - Pellet exports from North America rose in the 3Q/14 after a stable first half of the year that could be characterized as a temporary plateau. While pellet exports to Europe were up just marginally, the increase to Asia was more noticeable. 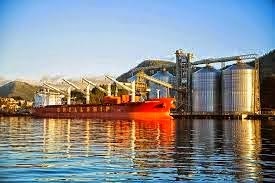 Up until 2014, more than 95% of wood pellets leaving US and Canadian ports were destined for Europe. Total Canadian overseas pellet exports rose slightly in the 3Q/14 from the previous quarter, but they were still 15 per cent below their high of over half a million tons in the last quarter of 2013. Shipments from both Western and Eastern Canada to Europe fell in the first three quarters of 2014; in the 3Q/14, shipments were at their lowest level since 2011. Export volumes for the Asian market have followed a more positive trend, with increased shipments for six consecutive quarters. British Columbia's pellet shipments overseas will likely remain stable during most of 2015 until the first of five announced pellet mills starts commercial operation late in 2015 or early 2016. There are currently plans to add over 800,000 tons of pellet capacity in the province during 2015/16 with South Korea being the target market (read more about the expansion plans in the NAWFR, www.woodprices.com).